1. HOW LONG WILL IT TAKE TO GET MY NEW MANTEL? All mantels and shelves ship in two weeks or less from the time we receive the order at the plant. 2. 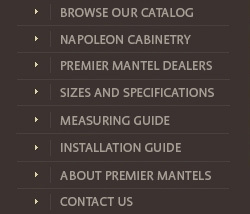 CAN I BUY A MANTEL DIRECT FROM YOU OR DO I HAVE TO GO THROUGH A DISTRIBUTOR? To order a mantel or shelf, you should contact a distributor in your area. To find a distributor, go to the DEALERS Section of the site and look under your state. If there is not a dealer listed in your area, please call or email us. Some of our distributors are regional wholesalers whose customers are not all listed. You can frequently contact one of them and get the name of a lumber yard, contractor, or home center in your area that carries Premier Mantels. 3. DO I HAVE TO HAVE A CONTRACTOR TO INSTALL MY PREMIER MANTEL OR SHELF? No, our mantels and shelves are very simple to install. Instructions are included with every mantel/shelf and are also available on this website. In addition, our toll-free number is listed on the instructions if you are unclear about any part of the installation procedure. 4. THE INSTRUCTIONS MENTION A MOUNTING BOARD, BUT MY MANTEL DOES NOT HAVE ANY INCLUDED. WHERE DO I GET THESE? The mounting boards are 1x2’s, available at any lumber yard. They are not included in with the mantel. 5. THE OPENING ON THE MANTEL I RECEIVED IS 1" WIDER AND ‘A" TALLER THAN WHAT I ORDERED. There is nothing wrong with your mantel. The scribe moulding which is installed after mounting the mantel is 1/2’ wide and will reduce the opening width by 1" and the opening height by 1/2". In many cases, the facing material is a natural material, such as marble, or a rough material, such as brick, which may not be completely straight on the edge. Premier Mantels recommends that the mantel overlap this material by at least 1/2" to prevent any gaps between the edge of the mantel opening and the facing material. This ensures you will have a straight, even finished edge.